The National Institution for Transforming India or the NITI Aayog is a new department of the Indian Central Government. Earlier, all reforms and programs were developed by the Planning Commission. Then the central government replaced it with the NITI Aayog. This department is responsible for research and development of schemes. 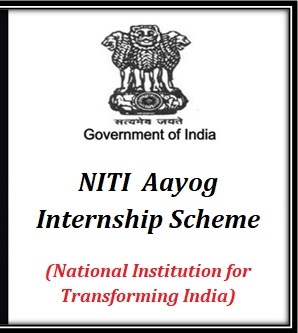 NITI Aayog had recently offered students with the opportunity to take part in internship schemes, under its several departments. The NITI Aayog Internship Scheme was announced by the central government on the 23rd of October, 2017. The declaration was done in New Delhi. The main aim of the implementation of this scheme is to offer students a closer look at the nation building process. As the interns get the opportunity to work under the heads of several government departments, they will be able to understand the scheme development process, and related researches. For students of various levels – The internship scheme will only allow students to apply for the program. The department will allow academic students, who desire to acquire a degree in under graduation, graduation; post-graduation or any research based academic line to be a part of this internship scheme. No payment for the interns – All selected interns, who get to experience the working of the central government departments, will not be offered any stipend or cash for the participation. Age limit for the internship – As per the draft, the NITI Aayog has not mentioned any upper or lower limit for the interns. Continuation of the internship – The internships are open throughout the year. Each month, candidates can apply for the scheme. Period of the internship (Time Duration) – The scheme also highlights that each intern will last for only six weeks. In case needs is felt by the head of the department, the internship can be extended for three months. Commencement and end of application (Important dates) – The application date commences on the 1st of each month. All interested candidates must make the application before the completion of first ten days of the month. Certificate for the interns – Once the internship is complete; all participants will receive a certificate from the respective department. It is not an assurance that they will receive a job in that department, but will get add some leverage to their academic degree. Necessary support – Each intern must bring with him/her a personal laptop to work on. In case the head of the department feels that other stationaries are needed, it will be arranged by the respective department. All the interested candidates will have to click on the official site of NITI Aayog http://niti.gov.in/ to register for the internship program. The registration page will remain active from for the first ten days of every month. As there are several departments to choose from, it is mandatory that all applicants mention which area they want to join. Every candidate will be able to apply only once to be a part of this internship scheme, during one financial year. A letter from the college Principal or HOD and a NOC must be submitted by the applicant who has been selected to be a part of the scheme. How are the candidates selected? Once all the candidates have submitted their online applications, they will be sorted and sent to the heads of all departments of NITI Aayog. Complete scrutiny will be done before the heads takes any decision. As per the terms, the heads of all departments will have the opportunity to pick only three candidates for each program. Before finalizing these names, the heads must get the names sanctioned from NITI Aayog’s CEO. In case any department has several applicants, the NITI Aayog will have the final say about the eligibility criteria, cutoff, and total number of candidates. It will be the task of the department heads to make sure that the internship goals are met properly. The curriculum will be discussed with the interns, and the schedule will be chalked out accordingly. During the internship, the head will have to keep a tab on the attendance of each intern, their work and progress. The head of each section will also have to judge the conduct of each intern. In case the student wants any data for the research work, he or she will have to get it sanctioned from the head. Once the internship is over, each intern will have to prepare a paper or report, and submit it to the department’s heads office.